Several decades ago, regular American guys could get by with a decent job with a decent wage on just a high school diploma. But things are very different today. 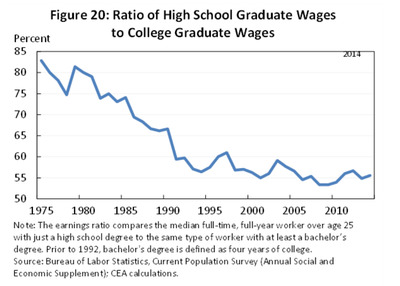 In a hefty report on the long-term decline in prime-age male labour-force participation, the White House’s Council of Economic Advisers shared a chart showing the ratio of high school graduate wages to college graduate wages from 1975 to 2014. Rather than making almost as much as their college-educated peers as they did 40 years ago, workers with only a high school diploma today make only about half as much on average. As you can see below, the ratio dipped significantly since the 1970s. 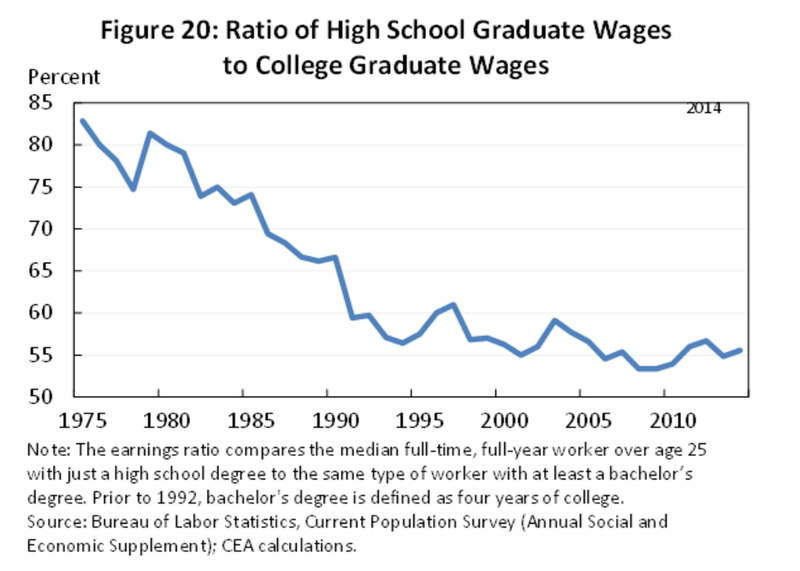 The relative wages of full-time, year-round workers with only a high school diploma fell from nearly 85% of the amount earned by those with at least a college degree to slightly above 55%. Putting those two trends together, we see an unusual situation where we have both lower wages and less labour supply. This is contrary to economics 101, which tells us that if there are fewer people available to do a job, they can theoretically command a higher salary, even in lower- and middle-skilled professions. It’s notable that there’s no one catalyst for the decline in lower-skilled and middle-skilled labour. Still, there is some empirical evidence suggesting that globalization has at least partially contributed to this phenomenon recently. Plus, technological advances are likely to have contributed too. And it’s also worth noting that male education levels have stagnated relative to those of women in the US. This, in turn, makes women more competitive applicants for a variety of jobs — especially those in the services sector. 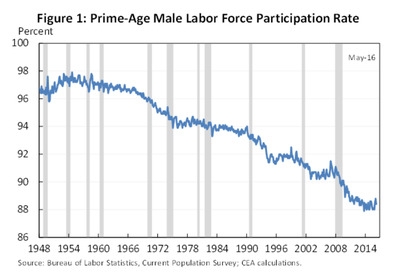 “These forces have, among other things, eliminated the large numbers of American manufacturing jobs over a number of decades … leaving many people — mostly men — unable to find new ones,” the CEA report noted. 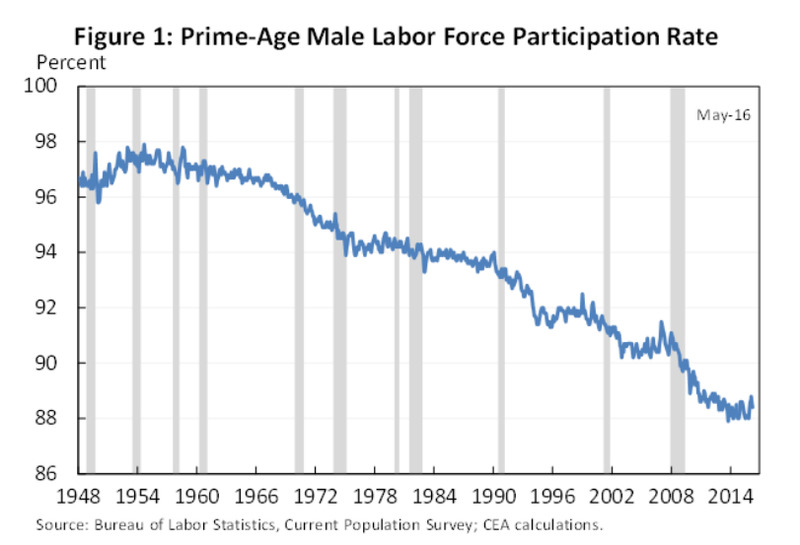 So, not only are men losing jobs amid demand shifts, but they are not getting back into the labour force.